Once upon a time, the St. Louis Blues were struggling to receive secondary scoring throughout the lineup. Luckily, one line was planting pucks past goaltenders more often than an annoying rabbit alerting a certain blond-haired girl how she was always running late. The STL Line, consisting of linemates Jaden Schwartz, Jori Lehtera and Vladimir Tarasenko, was on a scoring tear through early November, potting 13 of the Blues’ 25 goals in eight games from Nov. 1-15. Although it was an onslaught of offense from three of the teams’ up-and-coming stars, worries began to mount about the depth of the organization. Slowly but surely, goals began coming from other areas of the roster. Alexander Steen netted the game winner against the Ottawa Senators on Nov. 22, David Backes and Ryan Reaves tabbed goals against the Winnipeg Jets the following day and Backes tallied the game-tying goal in the third period in the Blues’ 3-2 shootout victory against the Minnesota Wild on Nov. 29. However, the offense still seemed to be getting carried by the STL Line. Tarasenko scored the overtime, game-winning marker against the Edmonton Oilers on Nov. 28 and was the difference in the shootout the next night in Minnesota. Things still seemed bleak for the rest of the St. Louis lineup. To make things worse, the Blues spotted the New York Islanders a 3-0 lead after the first period in this past Saturday’s contest. 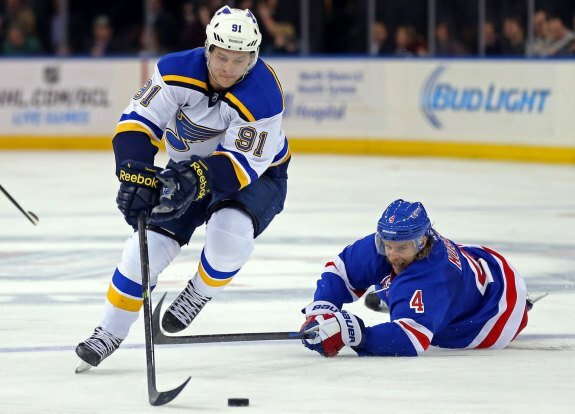 The high-flying New York team took control of the game and the focus shifted to the STL Line. It wasn’t the usual suspects who answered the bell, though. After a goaltending change saw starter Jake Allen leave the crease and Martin Brodeur enter, Paul Stastny, the Blues’ big signing of the 2014 offseason, scored early in the second period on the power play to cut the Islanders’ lead to 3-1. Patrik Berglund scored his third of the season at 4:28 when he tipped a Chris Butler shot from the point to give his team a fighting chance. Kevin Shattenkirk then tied the game at 12:34 of the same period on the power play for his third notch of the season. After Islanders superstar John Tavares scored late in the second period, the Blues received goals from Oshie (also his third) and another from Stastny (his fifth) to take a 5-4 lead with just over six minutes remaining in regulation. It took five goals from the rest of the lineup before the STL Line finally contributed to the scoresheet, as Tarasenko beat goaltender Jaroslav Halak after a pretty passing play with his linemates. The Blues returned home on Monday to battle the Florida Panthers, who had earned at least one point in the past three games. The game was dominated early by the Blues, receiving an early two-man advantage that saw Panthers goaltender make two dazzling saves and surrender no goals. However, it was the Blues’ fourth line that started the scoring. Maxim Lapierre wrapped around the Panthers’ net and whipped a shot along the ice that eluded Luongo at the 11:17 mark of the first period. It was Lapierre’s second goal of the season. The unexpected goal scoring was not finished there. Ian Cole tallied his third of the season at 17:34, firing a shot from the point that scorched past Luongo. After going scoreless in his first 21 games, the Blues defenseman amassed his fourth point in his past six games. The Blues sputtered through the second period, allowing one goal on 18 shots. Rookie defenseman Aaron Ekblad tied the game with just 5:06 remaining on the game clock in the third period, but it was another unlikely source that would allow the Blues to skate off as the victors. Chris Porter, playing in just his 10th game of the season, scored his second point of the night and first goal of the 2014-15 campaign at 18:06. He tipped a Barret Jackman shot from the point after Stastny forced a turnover deep in the zone. Stastny tallied an empty-net goal and the Blues held on for a 4-2 victory. The buzz among fans and media members revolved around Brodeur’s 690th career win, and first as a Blue on Scottrade Center ice, but the play of the Blues’ grinders was what caught the attention of the coaches and players. Porter, a two-time 30-point scorer in the AHL, caused his coach to gleam in the postgame interview. “He’s a low-maintenance guy,” Hitchcock said. “When you’re a depth player, you try not to make mistakes. We’re always trying to encourage him to play like he does in the American (Hockey) League. He’s a dominant 200-foot player at the American League level. Porter has been up and down with the Blues since he arrived in the NHL during the 2008-09 season. He’s amassed 11 goals and 27 points in 159 NHL games, spanning over six seasons. He’s signed five separate professional contracts and has been sent between the AHL and NHL countless times. Yet, his goal against the Panthers was the fifth game-winning goal in his career. For the Blues, the hope is that Porter and the rest of the crew can continue to find balanced scoring through the lineup. The STL Line continues to be the team’s best producers (all three players pace the team in points), but the team’s anticipated depth is showing signs of bleeding through. Schwartz, Lehtera and Tarasenko have combined for 43 percent of the Blues’ overall goal production this season. However, in the past 10 games, the STL Line has scored just 31 percent of the team’s goals. In the past two games, the line has scored just one of the team’s 10 goals. Imagine the end to this fairy tale with one line scoring and a supporting cast joining in on a nightly basis. That’s a story that the Blues hope to tell come playoff time.